I know some of you have been waiting for a punch art leprechaun. Here he is! You can get my punch art tutorial by subscribing to the February edition of Craft Project Central. $10 for 10 fantastic projects! BLOG CANDY ALERT! Leave a comment for a chance to win the February Edition! I think that little guy is sweet! Sure would like the directions for him. Will he still be available in March? You have outdone yourself! He is so-o-o cute. Love his jaunty style. Wow Kim he is so very cute. Love craft project central haven't joined for a while so would love to have the chance to win blog candy. Love the little leprechaun and pot of gold, they are so adorable. I check your blog often for the punch inspiration and projects you do. You have really outdone yourself. Thanks for sharing. I like him...he's cute! I'd love to have the tutorial...I'd love to win a free subscription. Thanks! super cute Kim! I have never been in to punch art but i have to say, once you try it it's kind of addicting! I love the leprechaun, very creative. thanks for the chance to win. I paid the 3 month fee JUST to have this tutorial! They are So Cute! Love the pot of gold! He is soo cute! I love the way he is made of so many different punches. Thank you for sharing such wonderful inspiration and projects. Love the little guy and also the pot of gold.Thanks for the chance to win some blog candy. He is so cute! How do you come up with such cute projects? Wow! Although you always do incredible punch art, when I clicked on the link I wasn't expecting such a perfect leprechaun. He is just amazing! Thanks for the inspiration! Oh my that little leprechaun is the cutest! I just saw some of the gold wrapped candy at Target yesterday. I would sure love to win the free subscription. TFS! Your leprechaun is too cute. My goal would be to make him and the pot of Gold for St patrick's Day. That is the cutest Leprechaun I've seen! You are one talented lady!! 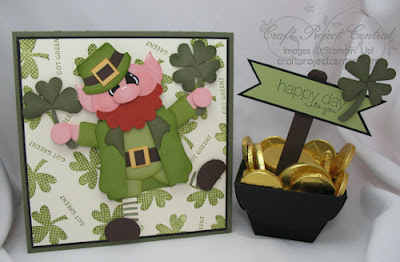 Beth H.
I love your leprechan! He's just adorable. Thank you for the opportunity to win the tutorial! he is just so cute. I love him very much. I love all your punch art. Just received my first order from Peachy Keen and can't wait to use them. Hope my designs turn out as nice as yours. Thanks for everything. I'd love to win a free subscription. Day and she would love him too!! You are very talented! !